Are You Toy Collector or Investor? Did you ask yourself this question before? A friend of mine, Liam is influenced by me, now he is also into Hot Wheels and Tomica. He is more into American Muscle and vintage cars. For Tomica, he collects trucks and construction vehicles. One fine day I asked him whether he is collector or investor, he replied collector without second thought. Immediate I challenge him by asking him how many Hot Wheels he had opened, the answer is none. If you are a collector, you shouldn't have bother to resale the die cast in the future. You passion should come from the intensity and quality of your collections. In other word, if you wish could sell it at higher price in the future, then you are obviously an investor. Between us, it is hard to distinguish in clear cut. In most cases, people buy at least 2 or more for open loose and extra for investment at the same time. Carded or uncarded? Let's leave this question to Hot Wheels collectors. 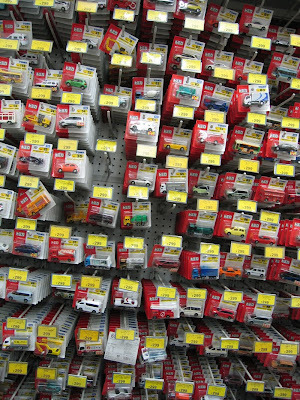 Fortunately for Tomica, the die casts are packed in the paper box. After displayed, you still can resale it at higher price as long as the box remain. If you don't, the die cast will consider loose item. Arrt, Why removed the comments?? 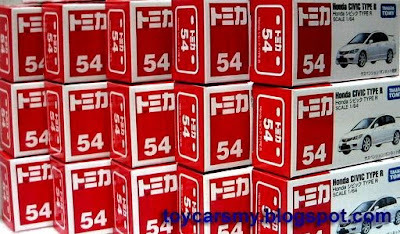 Do you have 1 unit of tomica no 54 honda civic type r? If have, please let me know. Thanks. i need serious help here...prawnking? anybody? help me!!! i'm more of a collector... but i prefer to have my collections in a box or card until i have a really nice place to display them. prawnking, the problem is im in kl, got no body can buy me those models in sg...huhu..
ADVedder .. contact me then we see how i can help out....what number you need first...let me know..